When I was nine years old, I convinced my parents to let me go to summer camp for eight weeks. My parents were skeptical, but I couldn’t wait to get there. I’d read lots of novels set at summer camps on wooded lakes, and it sounded like so much fun. Before I left, my mother helped me pack a suitcase full of shorts, sandals, swimsuits, towels, and . . . books. Lots and lots and lots of books. This made perfect sense to us; reading was a group activity in our family. At night and on weekends, my parents, siblings, and I would all sit around the living room and disappear into our novels. There wasn’t much talking. Each of us would follow our own fictional adventures, but in our way we were sharing this time together. So when my mother packed me all those novels, I pictured the same kind of experience at camp, only better. I could see myself and all my new friends in our cabin: ten girls in matching nightgowns reading together happily. But I was in for a big surprise. Summer camp turned out to be the exact opposite of quiet time with my family. It was more like one long, raucous birthday party—and I couldn’t even phone my parents to take me home. She finished with both her hands up, palms out, and a huge smile on her face. Okay, this was not what I was expecting. I was already excited to be at camp—why the need to be so outwardly rowdy? (And why did we have to spell this word incorrectly?!) I wasn’t sure what to think. Gamely I performed the cheer—and then found some downtime to pull out one of my books and start reading. Later that week, though, the coolest girl in the bunk asked me why I was always reading and why I was so “mellow”—mellow being the opposite of R-O-W-D-I-E. I looked down at the book in my hand, then around the bunk. No one else was sitting by herself, reading. They were all laughing and playing hand games, or running around in the grass outside with kids from other bunks. So I closed my book and put it away, along with all the others, in my suitcase. I felt guilty as I tucked the books under my bed, as if they needed me and I was letting them down. For the rest of the summer, I shouted out the ROWDIE cheer with as much enthusiasm as I could muster. Every day I pumped my arms and smiled wide, doing my best approximation of a lively, gregarious camper. And when camp was over and I finally reunited with my books, something felt different. It felt as if, at school and even with my friends, that pressure to be rowdy still loomed large. In elementary school, I’d known everyone since kindergarten. I knew I was shy deep down, but I felt very comfortable and had even starred in the school play one year. Everything changed in middle school, though, when I switched to a new school system where I didn’t know anyone. I was the new kid in a sea of chattering strangers. My mom would drive me to school because being on a bus with dozens of other kids was too overwhelming. The doors to the school stayed locked until the first bell, and when I arrived early I’d have to wait outside in the parking lot, where groups of friends huddled together. They all seemed to know one another and to feel totally at ease. For me, that parking lot was a straight-up nightmare. Eventually, the bell would ring and we’d rush inside. The hallways were even more chaotic than the parking lot. Kids hurried in every direction, pounding down the hall like they owned the place, and groups of girls and boys traded stories and laughed secretively. I’d look up at a vaguely familiar face, wonder if I should say hello, and then move on without speaking. But the cafeteria scene at lunchtime made the hallways look like a dream! The voices of hundreds of kids bounced off the massive cinderblock walls. The room was arranged in rows of long, skinny tables, and a laughing, gabbing clique sat at each one. Everyone split off into groups: the shiny, popular girls here, the athletic boys there, the nerdy types over to the side. I could barely think straight, let alone smile and chat in the easygoing way that everyone else seemed to manage. Does this setting sound familiar? It’s such a common experience. Meet Davis, a thoughtful and shy guy who found himself in a similar situation on the first day of sixth grade. As one of the few Asian American kids at a mostly white school, he was also made uncomfortably aware that other students thought he looked “different.” He was so nervous that he barely remembered to exhale until he arrived in homeroom, where everyone gradually settled down. Finally, he could just sit and think. The rest of the day went on similarly—he barely navigated his way through the crowded cafeteria, feeling relieved only during quiet moments in the classroom. By the time the bell rang at 3:30 p.m., he was exhausted. He had made it through the first day of sixth grade alive—though not without somebody throwing gum into his hair on the bus ride home. As far as he could tell, everyone seemed thrilled to be back again the next morning. Everyone except Davis. Things started looking up, though, in ways Davis could never have imagined on that stressful first day. I’ll tell you the rest of his story soon. In the meantime, it’s important to remember that no matter how cheerful they might have seemed, the kids at my school and at Davis’s probably weren’t all happy to be there. The first days in a new school, or even one you’ve been going to for years, can be a struggle for anyone. And as introverts, our reactivity to stimulation means that people like Davis and me really do have extra adjustments to make. What do I mean by “reactivity to stimulation”? Well, most psychologists agree that introversion and extroversion are among the most important personality traits shaping human experience—and that this is true of people all over the world, regardless of their culture or the language they speak. This means that introversion is also one of the mostresearched personality traits. We’re learning fascinating things about it every day. We now know, for example, that introverts and extroverts generally have different nervous systems. Introverts’ nervous systems react more intensely than extroverts’ to social situations as well as to sensory experiences. Extroverts’ nervous systems don’t react as much, which means that they crave stimulation, such as brighter lights and louder sounds, to feel alive. When they’re not getting enough stimulation, they may start to feel bored and antsy. They naturally prefer a more gregarious, or chatty, style of socializing. Theyneed to be around people, and they thrive on the energy of crowds. They’re more likely to crank up speakers, chase adrenaline-pumping adventures, or thrust their hands up and volunteer to go first. We introverts, on the other hand, react more—sometimes much, much more—to stimulating environments such as noisy school cafeterias. This means that we tend to feel most relaxed and energized when we’re in quieter settings—not necessarily alone, but often with smaller numbers of friends or family we know well. In one study, a famous psychologist named Hans Eysenck placed lemon juice—a stimulant—on the tongues of adult introverts and extroverts. The human mouth’s natural response to a burst of lemon juice is to produce saliva, which balances out the acidic citrus taste. So, Eysenck figured he could measure sensitivity to stimulation—in this case the stimulation of a drop of lemon juice—by measuring how much saliva each person produced in response to the liquid. He guessed that the introverts would be more sensitive to the lemon juice and generate more saliva. And he was right. In a similar study, scientists found that infants who are more sensitive to the sweet taste of sugar water are more likely to grow up to be teenagers who are sensitive to the noise of a loud party. We simply feel the effects of taste, sound, and social life a little more intensely than our extroverted counterparts. Other experiments have yielded similar results. 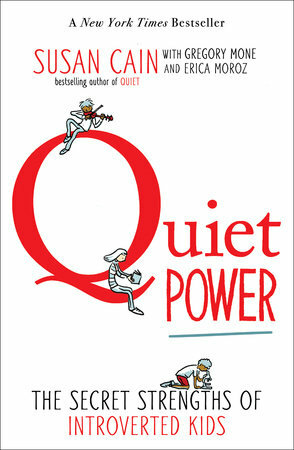 The psychologist Russell Geen gave introverts and extroverts math problems to solve, with varying levels of background noise playing as they worked. He found that the introverts performed better when the background noise was quieter, while the extroverts did fine with the louder sounds. This is one reason that introverts like Davis tend to prefer being around just a few people at a time; it’s less overwhelming than being surrounded by many different people at once. At parties, for example, we introverts can have a fantastic time, but sometimes we run out of energy sooner and wish we could leave early. Spending time alone in quiet settings recharges introverts’ batteries. That’s why we often enjoy solo activities, from reading to running to mountain climbing. Don’t let anyone tell you that introverts are antisocial—we are just differently social. Thriving at school or anywhere else comes more naturally when you’re in an environment that allows your nervous system to function at its best. And the fact is, most schools are not environments for introverts’ nervous systems. But once you start paying attention to the messages your body is sending you—such as feeling anxious or overwhelmed—the power is in your hands. You’ve recognized that something feels off, and now you know that a change needs to be made. You can take action to find your equilibrium—even before you get back to the sanctuary of your room at home. You can listen to your body and seek out the quiet spots in your school to collect yourself, such as a library or computer lab or the empty classroom of a friendly teacher. You can even duck into the restroom to have a moment to yourself! Davis probably understood this intuitively; that’s why after the gum incident, he started sitting at the front of the bus, where no one bothered him. He tried to tune out the rip-roaring sounds of games and phones beeping and of kids shouting and laughing. Soon enough, he found a pair of earplugs and used the bus time to read. He plowed through the whole Harry Potter series and turned to self-improvement books, likeThe Seven Habits of Highly Effective Teens and How to Win Friends and Influence People. Shutting out the noise was his way of reducing stimulation and keeping his head clear. There’s a lot to figure out as we move through adolescence. Our physical, emotional, and social needs are all going in new directions, and it can feel as if these needs have been tossed into a blender and remixed into something different. It’s both scaryand exciting. While you’re navigating the social sea, remember that even your more extroverted friends are working through social insecurities of their own. Adolescent insecurity is something weall go through—even if we have an older sibling to show us the ropes, or have watched lots of movies about high school, or have been popular since kindergarten. Dr. Chelsea Grefe, a New York–based psychologist, has some thoughts about what someone in Karinah’s shoes can do to prepare for these kinds of situations. Dr. Grefe recalls meeting a bright and artistically gifted fifth grader who was nervous about making conversation with other kids. The girl wanted to expand her social horizons. She had two really good friends at school but felt lost when she was separated from them. Dr. Grefe encouraged the girl to brainstorm before entering situations she knew would be uncomfortable. “It was about making a plan and role-playing how to initiate conversations,” she says. First, Karinah identified girls in other groups whom she felt comfortable approaching. Then she set herself a goal: to ask them one-on-one if they wanted to sit together or hang out later. This pre-planning allowed her to avoid approaching a cafeteria table full of people with no clue what to say. Dr. Grefe suggests coming up with some conversation starters, even simple ones such as: “What did you do this weekend?” or “Are you getting excited for this particular school event?” This way, you’re prepared as you enter a social situation and have something to fall back on. Maggie, a college student from Pennsylvania, used to compare herself to other kids in her class—the bubbly ones, the “natural leaders.” She often wondered why the popular kids were so popular. Some of them weren’t even that well liked! Sometimes they were the most attractive, or athletic, or smart, but often it seemed more about how outgoing they were. They were the ones talking to whomever they wanted, or shouting out in class, or throwing parties. These werenot qualities that she had, and sometimes she felt ignored—or weird—because of it. “When all the loud kids or popular kids were talking and laughing, I’d feel like, ‘Ugh, why can’t I just join in their conversation? It’s not a big deal! What is wrong with me?’” After all, Maggie was funny and kind. She had things to say. But at school, she didn’t show off these qualities, so she felt unnoticed and underappreciated. As I said earlier, a third to a half of the human population is introverted. Being introverted is not something to outgrow; it is something to accept and growinto—and even to cherish. The more you notice how special your introverted qualities are—and how some of the things you like best about yourself are probably connected to your introverted nature—the more your confidence will flourish and spread to other areas of your life. You don’t have to pick the activity, or befriend the people, you think you’resupposed to. Instead, do what you enjoy, and pick friends whose company you truly value. A girl named Ruby told me that during high school she twisted herself into a pretzel trying to be a gregarious “freshman mentor,” because that was a prestigious role at her school. Only after she was kicked out of the program for not being outgoing enough did she realize that actually she preferred science. She started spending time after school working with her biology teacher, and she eventually published her first scientific paper at the age of seventeen. She even won a university scholarship for biomedical engineering! As Ruby’s story shows us, there are all kinds of things that we really should do as good people, like being kind or helpful to our friends and families. But there are also so manysupposed to’s. In my first year of middle school, I struggled to be the outgoing version of myself I thought I was supposed to be: bubbly, cool, and loud. It took me time to realize that I could just be whoever I was naturally. After all, the people I looked up to—my heroes and role models—were writers. They seemed genuinely cool to me—and most of them also happened to be introverts. Even though back then I didn’t have the benefit of understanding my nervous system, or even a word to describe my personality, I eventually started adapting my social life to its needs. I made some really great friends, and I noticed that I wanted to hang out with them one or two at a time, not in big groups. I decided that I wasn’t going to have the largest number of friendships, but I was going to have plenty of deep and excellent ones. And I’ve continued doing that all my life. I’ve come to realize not only how important it is to follow my instincts and interests, but also to express my feelings and explain my actions to others. Here’s an example that might be familiar to you: Say you’re walking through the hallway, from one class to another, deep in thought or possibly overwhelmed by the noise and crowds. You pass a friend or classmate and glance at her briefly, but you’re so preoccupied that you don’t manage to stop to say hi and chitchat. You haven’t meant to be rude or hurtful, but your friend thinks you’re angry about something. Be on the lookout for moments of misunderstanding such as this one, and do your best to explain what you were thinking and feeling. An extroverted friend—and maybe even an introverted one—likely won’t guess that you were distracted by your thoughts or by too much sensory stimulation, and your explanation will make all the difference. Robby tried to explain the differences between introverts and extroverts to an outgoing friend, but she couldn’t understand his perspective. She thrived in loud, busy places and didn’t see why he needed to be alone so often. Another friend of his, Drew, grasped the idea immediately. Drew was more of an ambivert. He wasn’t as outgoing as his younger sister, but he wasn’t as reserved as his parents, either. The more he talked with Robby about what it was like to be introverted, the more he wanted people to understand both sides of his own personality. As an amateur filmmaker, Drew had been experimenting with a new animation style, and after researching the subject of introversion, he produced an animated, graphics-intensive public service announcement about what it means to be quiet. Drew posted it on YouTube, but that was only the start. He was also a producer of the high school’s television news show. Once a week, every student in the school watched the latest episode, and in one of these Drew included his PSA on introverts. The response was overwhelming; even one of the teachers, who was secretly introverted, expressed his gratitude. “I was able to bring the whole school community to an understanding,” Drew said. “For weeks afterward, people would come up to me and say, ‘Hey, that was awesome!’” His friend Robby thanked him more than anyone. Every school could benefit from a deeper understanding of the different strengths and needs of introverted and extroverted students. The middle and high school years are the most difficult times to be introverted, because when hundreds of kids are crammed together in a single building it can feel as if the only way to gain respect and friendship is through vivacity and visibility. But there are so many other great qualities to have, such as the ability to focus deeply on topics and activities, and a talent for listening with empathy and patience. These are two of the “superpowers” of introverts. Channel them; find your passions and pursue them wholeheartedly. Then you will not only survive but alsothrive. Understand your needs: The boisterous environments common to schools are often taxing to introverts. Acknowledge that sometimes there will be a mismatch between you and your environment, but try not to let it stop you from being you. Find quiet times and places to recharge your batteries. And if you prefer to socialize with one or two friends at a time, rather than in a big group, that’s just fine! It can be a relief to find people who feel the same way, or who just understand where you’re coming from. Look for your own circle: You may find that your sweet spot is with athletes, coders, or with people who are just plain nice whether or not your interests are perfectly aligned. If you need to make a checklist of things to talk about in order to get a friendship rolling, go for it. Communicate: Make sure your closest friends understand why you retreat or become quiet at times during school; talk to them about introversion and extroversion. If they’re extroverts, ask them whatthey need from you. Find your passion: This is crucial to everyone, regardless of personality type, but it’s especially important for introverts, because many of us like to focus our energy on one or two projects we really care about. Also, when you’re feeling scared, genuine passion will lift you up and give you the excitement you need to propel you through your fear. Fear is a powerful enemy, but passion is an even stronger friend. Expand your comfort zone: We can all stretch to some degree, pushing past our apparent limitations in the service of a cause or a passion project. And if you’re stretching into an area that really frightens you—for many people, public speaking falls into this category—make sure to practice in small, manageable steps. You’ll read more about this in chapter 13. Know your body language: Smiling will not only make other people comfortable around you—it will also make you happier and more confident. This is a biological phenomenon: Smiling sends a signal to the rest of your body that all is well. But this principle is not just about smiles: Pay attention to what your body does when you’re feeling confident and at ease—and what it does when you feel tense. Crossing your arms, for example, is often a reaction to nervousness, and it can make you seem—and feel—closed off. Practice arranging your body in the positions that don’t signal distress—and that make it feel good.